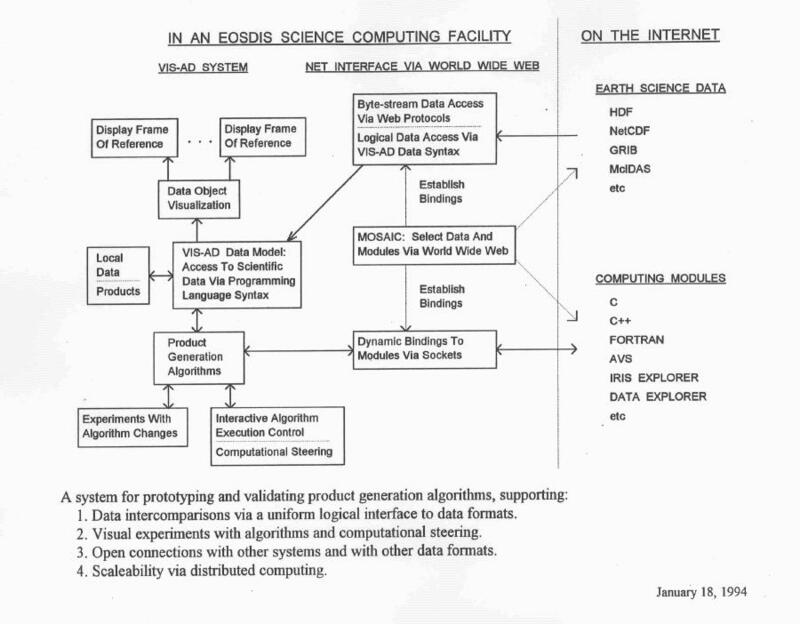 This diagram was drawn for a 1994 proposal to NASA's EOSDIS. The proposal was not funded, but its ideas were the basis for the rewrite of VisAD in Java, the language designed for the network. The redesign featured an improved data model (particularly integrated a greater variety of metadata) and an improved display model (particularly for supporting user interaction and user customization). It also defined all system components as distributed objects. The Java version of VisAD was first demonstrated at the Januray 1998 AMS Conference and at the 1998 JavaOne Conference (thanks to Sun for providing a booth at that meeting). We announced the public availability of VisAD the day after Sun announced the public availability of beta version of Java3D. At this time the VisAD design and implementation are pretty stable. The real design action has moved to the systems using the VisAD library, such as Unidata's Integrated Data Viewer (IDV) and VisBio.